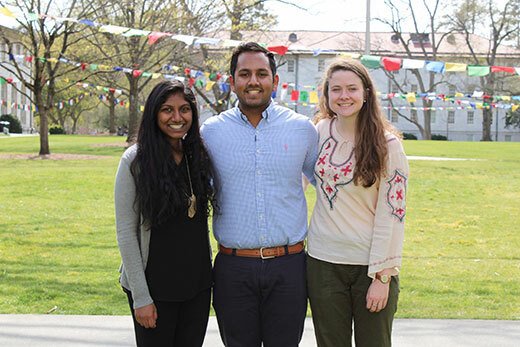 "I’ve learned the humanities can provide the framework to understand people and the experience of illness,” says Somnath Das (center), who is organizing an April 11 conference on health humanities with Preethi Reddi (left) and Anna Farrell. Photo by Nicole Zhou. The Emotive Arts Series will be held Tuesday, April 11, from 6 p.m. to 9 p.m. at the Miller Ward Alumni House. RSVP online. Somnath Das graduates this spring from Emory College of Arts and Sciences with a degree in chemistry and neuroscience and behavioral biology (NBB), with medical school on the horizon. But he believes it was an English class that will make him a better doctor. English professor Laura Otis, who began her career as a scientist, taught “Languages of Emotion” by comparing the way creative writers and scientists wrote about emotions. Das realized that understanding different perspectives would help in medicine, and learning in general. “Students can often struggle with what medicine truly looks like, but I’ve learned the humanities can provide the framework to understand people and the experience of illness,” says Das, who is organizing a conference on health humanities on April 11. The Emotive Arts Series will be held from 6 p.m. to 9 p.m. at the Miller Ward Alumni House. The conference will focus on the issue of disability and the humanities, looking at the experience of disability from various disciplines in a bid to start more students talking about areas of intersection. Students from both the sciences, where multiple samples of information are used to generalize trends, and from the humanities, where single narratives can often illustrate a broader point, are encouraged to attend. Events include a student art gala, spoken word performances with American Sign Language interpretations and keynote addresses by Jennifer Sarrett, a lecturer in the Center for the Study of Human Health and co-director of the Emory Disability Studies Initiative (DSI), and Rosemarie Garland-Thomson, a professor who teaches English and bioethics and is a founding director of the DSI. Garland-Thomson says she is heartened that the event is student-led, noting that because anyone can become disabled at any point in their lives, the discussion has broad appeal. She plans to discuss her 2016 piece in the New York Times, “Becoming Disabled,” addressing both the issues of solidarity it raises and the ongoing response to her essay. “A doctor’s job is to see us as medical subjects who need to be fixed, but what they also must be aware of is that everyone, who can become disabled at any point and often will if they live long enough, should be seen as political or culture-making subjects,” Garland-Thomson says. First-year students Anna Farrell and Preethi Reddi are co-organizing the conference, in the hopes of making it an annual event when Das graduates. Farrell, who just declared a major in NBB while also considering English, said her interest in the issue came from her own readings about end-of-life care and mortality. Reddi, who also recently declared an NBB major, says Emory has been an ideal place for understanding the connections between science and the humanities after first being exposed to such collaborations in the World Food Prize program in high school. “It’s a good idea to bring awareness of the importance of the human aspect to medicine, whether you’re going to be a physician or a patient,” Reddi says.